The weather was warm and the sun was bright in the hours before the next spring storm rolled into the valley. I decided to spend a few hours taking photos of headstones and posting them on Find-a-grave and Footnote taking advantage of a Pay-It-Forward opportunity. Sometimes you just have to walk away from a complex problem at work for a while and do something different to give your perspective a chance to reset and re-look at the problem through a different window. I noted that many of the headstones included notations of military service and that the death date on many of them corresponded with the years of respective military conflicts and wars. There were considerably more headstones showing military service that I would have guessed. 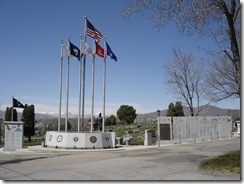 I briefly stopped and looked at the VFW and City Memorial to Veterans when I entered the cemetery, but could now see that I needed to go back to it and read comments and names etched in granite with more reverence and in greater depth. Standing by the memorial was an older gentleman out for his daily walk. Dressed in tan chino's, a red jacket and cap, he stood reading the names on the World War II memorial. Walking up to him I said "hello" and said that I too was going to take the time to read the names listed on the memorial in front of us. After a moment, I asked if he was as veteran too and received a nod. "Do you know any of the men listed here?" Another nod. He pointed to a name and then motioned that the man had saved his life. When he turned to look at me, tears were in his eyes and on his cheeks. My respect for the 'names' on the memorial grew even deeper in those few seconds as I felt the impact that his wordless communication had conveyed. He never did speak to me, whether he no longer could due to his health or because of the emotion he felt. He turned and slowly continued on his walk and left me staring at his receding red jacket deep in thought. Memorial Day is quickly approaching. Don't forget to honor our Veterans this year. Teach your family about their sacrifices when they served their country and protected the freedoms that much of the world enjoys today. Take photos of the headstones of your loved ones and those of some of the veterans buried near them and share them with the world this year. Post them along with their stories where we can all find and read them. Let us not forget any of them.